Pata Yamaha Official WorldSBK Team rider Michael van der Mark got the final part of his 2018 FIM World Superbike Championship campaign off to a flying start today, with a superb third place finish in Race 1 at Portimão to secure the last spot on the podium. 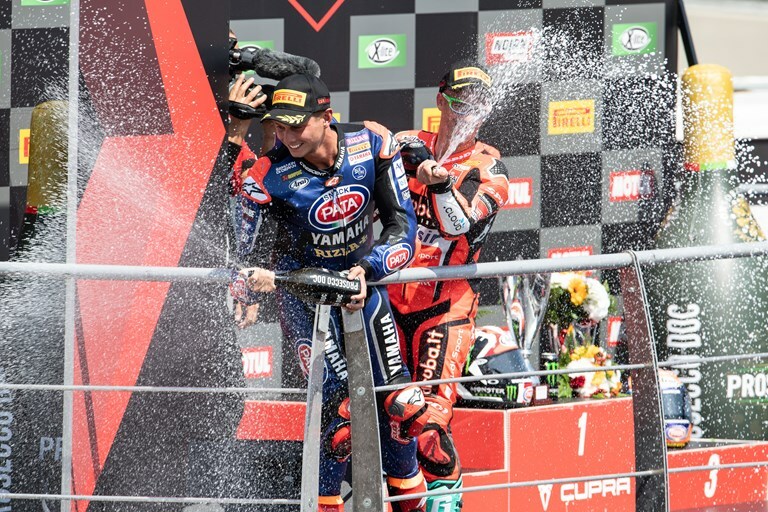 Alex Lowes rode an intelligent race to pick up valuable championship points with tenth place, after overcoming some technical issues in the 20-lap race. Van der Mark set himself up for today’s podium finish during qualifying this morning, which the 25-year-old Dutch rider finished just 0.2s off pole position to secure fifth place on the second row of the grid for the race. The track temperature had risen significantly by the time the riders lined up on the grid, with the result that rear grip became increasingly difficult to find. However, van der Mark was able to maintain a fast and consistent pace in fourth place during the first half of the race, before being elevated to third when Lorenzo Savadori crashed in front of him at half race distance. Van der Mark remains third in the championship standings with 264 points, but today’s podium finish saw him close the gap to second-placed Chaz Davies to just 27 points.